Authors: Lopatina A. Screbtsova M.
This book helps to develop moral and spiritual qualities in the educational process through stories, games, science and other school subjects, gives better understanding and appreciation of the world around us. The 1st edition of this book has been published in Russia in 2002. The 2nd and 3rd editions were published by Amrita-Rus' in 2003 and 2004. This book will teach it's reader to listen to one's heart, to understand and apprehend the noble qualities that has been given to each of all of us by our Creator and to develop them at the best of our ability. 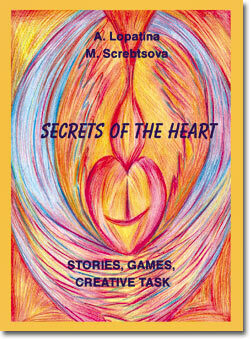 The stories, games, lessons and creative tasks in the book SECRETS OF THE HEART tell about love, honesty, responsibility, modesty, friendship and care for others. FRAGMENTS FROM THE BOOK "SECRETS OF THE HEART"
These are the series of 19 fairy-tale stories about 3 tiny mice-brothers: Orange Back, Home-Sitter and Quick Paws. In light entertaining form it tells children HOW difficult it can be in our real life to follow one's heart and to do as it says. And how difficult is to find a true friend. These stories are aimed for small children, but, as any philosophy fairy-tales, they can be helpful for adults too. Early one morning Redback the mouse squeezed out of the burrow beneath the old pine tree and scrambled up the rough trunk. He found himself a comfortable spot on a wide, stout branch, and settled down to wait for the sun to show itself over the edge of the mountains. "If you sit quiet as can be," Redback thought to himself, "you'll be able to catch the very first sunbeam - and you can learn about the Most Important Thing. Sunbeams live high up in the sky, and from there they can see everything, and they know everything." Redback wanted very much to understand the Most Important Thing: where did the forest come from, and the sun, and the stars - and the whole wide wonderful world? But nobody else cared - not the big creatures, and not the little ones either. "What a silly question!" snorted the hare, when the little mouse asked him where the forest and all the other things came from. "What do I need to know that for? All I need to know is which kinds of grass taste good, and which kinds are poisonous, and how to hide if somebody wants to catch me." The squirrel tut-tutted and hustled off to fetch a cedar nut from her winter stores. "Here, little mouse," she said, "Have a bite of this, now. It's so sweet you'll forget all about that funny question of yours." Even the mouse's very own brothers - Swiftpaw and Homey - couldn't answer such an important question. "There you go again," Swiftpaw told Redback, shaking his head. "How long are you going to sit around thinking, anyway? The fur on your back's going all red!" Redback felt a little hurt, and he stood up as straight as a little mouse can. "The sun is turning my fur golden, that way I can hear the sunbeams." "Hey, little brother, I didn't mean to make you mad. But you really ought to busy yourself studying nature's secrets, instead of sitting around and waiting for her to tell you something," Swiftpaw scolded good-naturedly. Swiftpaw Mouse knew lots of magic secrets: he could tell you which flowers held the sweetest nectar, which tender roots were the best to eat, and which leaves to put on cuts and scratches to make them feel better. Many times he had made long trips to the mountain or lake, which was why they called him Swiftpaw. "Instead of fooling around with that nonsense why don't you give me a hand changing the straw in the bedroom? You and your brother are out and running about all day, or lazing about somewhere, and I have to do everything myself." Homey was a kindhearted mouse, and hard-working, too. Thanks to him their house was a truly fine home. One day while Redback sat waiting for the sun to come up he got to thinking so much that he didn't even notice how the first sunbeam touched him gently on the ears, then hopped to his shiny black nose and reddish fur. And then, for the longest time, the little mouse sat as if he were frozen to the spot, and he came to only when Swiftpaw called his name several times. "Hey, Redback, get down here, are you deaf or something? Come on, yesterday I found this great patch of strawberries. Let's go have a treat!" Redback climbed down, but the look in his eyes was so far away that his brother laughed out loud. "Don't be so serious. Someone will have you for lunch!" Redback sighed and rubbed his face with his paws, as if he were just waking up, and then he said, "You know, something amazing happened to me today! A sunbeam came to see me." "Now that's sure special," Swiftpaw laughed again. "You mean you never noticed that the sunbeams come every morning to you, and to me, and to all the animals and birds and flowers? Now come on, let's go!" And the sunbeam answered, "Who do you think I am?" "You're a warm and gentle stream of sunlight. You tickle me inside and warm up my heart." The sunbeam glowed extra-bright and answered, "You're right, little mouse. Whatever you see in me, that is always just what I am." I asked, "Why didn't you come to see me before? I've been waiting for so long!" "I did come, little friend. I came to you every morning, and you knew that, or you wouldn't have come hurrying out to meet me each day. But you didn't hear me." "You're amazing! You shine on me from the outside, but it's like you're inside me, too. You haven't got ears or a face like me, but you hear me and talk to me. You're inside my heart, but you're bigger than the whole world!" The sunbeam glowed again and said, "Remember those words well, and I will never leave you. There are many more wonderful things I can show you…"
And then you called me, and I couldn't hear him anymore. What do you think? Who was it?" Redback asked. "Hm," Swiftpaw looked thoughtful. "Maybe you swallowed a sunbeam by accident, and now it's inside you?" "No, it's not like that," Redback answered. "I haven't swallowed anything. I didn't even open my mouth. We talked without words, I told you. I think it was a magic sunbeam. He can talk, and I'll bet he came from the chief wizard, who knows everything about everything in the whole world. Tomorrow I'll ask him about the Most Important Thing. But right now those berries sure would hit the spot." And so the mouse brothers, squeaking cheerfully, ran off to the strawberry patch.